The best examples of horror in media are rarely those concerned with men donning hockey masks or knifed gloves, but real human issues. Decay: The Mare purports to do exactly this with its tale of a drug addict in rehab, but this is quickly revealed to be a thin facade to trick players into an egregiously shallow experience. This is mostly down to the fact that this entire drug addict component is completely done away with after the poorly-compressed opening cinematic coated in film grain. The first two of three episodes don’t even feature any narrative threads outside of audio logs, plagued by poor writing and melodramatic voice acting rampant with pauses so blatant in their intent that they’re rendered a comical pastiche, much like the rest of the game. These serve to lay some groundwork for the ill-considered, threadbare plot that is delivered in the span of about a minute during the game’s climax. There’s also something about gang warfare in there that is completely random and disconnected from everything else, but that is also introduced and quickly concluded in the span of about thirty seconds. 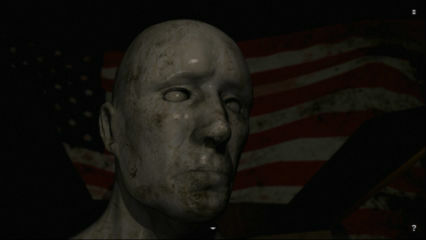 Visually, the graphics fit the theme of low-budget horror that the writing establishes. It looks like something out of 2001, where games attempted realistic graphics but simply didn’t have the technology to fit the art style. Everything from the art to the animations is coated in a thick layer of this bargain-basement slime, whereas a more interesting artistic approach might have covered for these flaws. Outside of some mildly interesting imagery in the first episode, though, perhaps there was just an immense dearth of visual ideas; there’s a talking hand-in-a-bag and that’s about it. The monster – who is just a man with an unfortunate skin condition – suffers from this as he looks more amusing than scary. None of it ever comes across as scary or malicious, a problem that plagues the set pieces. There are a handful of jump scares scattered throughout the game’s three episodes, but they’re heavily forecast and lack a sufficient build in tension: After the first time you’re interrupted by static to be shown a lone chair in a room, you’re expecting the second where the chair is replaced with something else. Similarly, the screen lingers on a hole so long that the eventual scare is completely ineffective. The only time any sufficient tension is built, it’s wasted on one of these impotent jump scares. 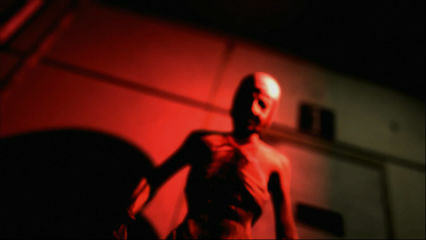 During the second episode, the player is given a camera that is later used to navigate a room bathed in darkness where the only sound is heavy breathing. It’s genuinely discomforting, but it’s thrown away on a comical body on the return trip. This camera is also used in a number of puzzles involving hidden numbers, but it’s really just another layer of obfuscation on an otherwise overly simplistic puzzle. The third episode also features another new puzzle-solving mechanic in the form of a pocket watch that can reverse time, but it’s only ever used twice to move obstacles out of the player’s path and then completely forgotten about. Puzzle design as whole, in fact, is incredibly basic. When it isn’t a literal list of instructions, it feels like one: You get a scrap of paper that tells you exactly which direction you need to go in a “Lost Woods” style series of rooms, and a few scraps of paper telling you exactly where to look for nails to thrust into a teddy bear’s face to appease the hand-bag’s fetish for plushie mutilation (it seems). It’s a bit like Care Bears meets Fifty Shades of Grey or something? There’s also a combination of button presses on a statue’s head that you just brute force until you stumble upon the correct combo. Players navigate between these puzzles using controls that have been lazily translated over from the game’s mobile roots. Arrows at the sides will turn the player’s view between the static screens, while clicking on objects within these will interact with them. This, along with the lack of a map, can make it quite easy to get lost within each episode’s very small levels. That can be quite frustrating when the player knows exactly which room to go to but the game refuses to communicate its logistics well enough – but this is somewhat relieved by the hint button that will point you in the right direction. Though having to rely on a hint system to navigate the place only serves to highlight what a mess the maps are, really. This also leads to copious redundant screens plaguing the player’s journey through this noxious title, such as having to click a button to face backward so that they can enter the door instead of just having the button send them through it. This doesn’t even fly on mobile any more since 3D landscapes are perfectly achievable there, so why on Earth would it be okay on PC? The only positive aspect of Decay: The Mare is that it’s mercifully short, its torturous journey through the three episodes uttering its final insipid sigh and crawling back into its grave after only a couple of hours. This game utterly fails to achieve anything, and can’t be recommended to even the most forgiving of horror aficionados.